the New Zealand Territory of Tokelau. This rare, premium keyword geodomain name, TOKELAU.COM, is FOR SALE BY ORIGINAL OWNER for only $3,800 US dollars as of September, 2018! This is the first time its being offered for sale due to a recent change in life plans for the owner - and IT'S PRICED TO SELL, so if you have family, or business interests in Tokelau, this is your chance to own an invaluable internet property piece of domain gold at a rock bottom price. Serious buyers contact here. Your gateway to Gustavus and magnificent Glacier Bay Park. The folklore capital of Peru lies on the shore of Lake Titicaca. courtesy of Tokelau Liaison Office, Samoa. Tokelau is a non-self-governing territory of New Zealand consisting of three coral atolls in the South Pacific: Atafu, Nukunonu, and Fakaofo. These atolls lie approximately mid-way between Hawaii and New Zealand and about 500 km north of Samoa. Formerly known as the Union Islands, the name 'Tokelau Islands' was adopted in 1946 and then shortened to 'Tokelau' in 1976. 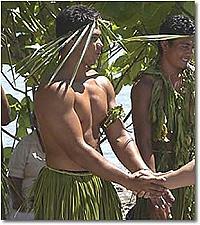 Simply put, Tokelau culture IS Polynesian culture. Fakaofo youth fishing on the outer reef. 'Tokelau' is Polynesian for 'North Wind'. According to archaeological evidence, the islands were settled about 1000 years ago. Tokelau has no harbors or ports nor does it have an airport.The best way for tourists and travelers to get to Tokelau is from Apia, Samoa, by ship, which runs every 2 weeks..
Today, more Tokelauans live outside Tokelau than on the islands. About 6,800 live in New Zealand. According to the Central Intelligence Agency's list of countries by GDP, Tokelau has the smallest economy of any country in the world, with an annual purchasing power of about US $1,000 (€674) per capita. Most food and drink is shipped to the islands, as little can be grown on these coral atolls. There is little native fauna on the atolls. Lizards are common. Migratory seabirds visit Tokelau frequently. The geographic future of Tokelau depends on the height of the ocean. No significant land is more than two metres above high water of ordinary tides. This means Tokelau is particularly vulnerable to any possible sea level rises caused by global warming. According to archaeological evidence, the islands were settled about 1000 years ago. Several hundred years of oral history remain, showing a belief in Polynesian mythology and the worship of the god Tui Tokelau. Tokelauan society was ruled by clans. Each atoll was independent until the 18th century, when Fakaofo conquered Atafu and Nukunonu and united the three atolls. Inhabitants lived a subsistence lifestyle, relying on fish and coconuts for sustenance. Vice-Admiral John Byron of England found Atafu on his 1765 voyage but saw no signs of inhabitants. In 1791, Captain Edward Edwards found Nukunonu while searching for mutineers from the HMS Bounty. The US whaling ship General Jackson reached the island of Fakaofo in 1835. Catholic and Protestant missionaries from Samoa sailed to the islands in the mid-1800's, the former converting most inhabitants of Nukunonu and the latter converting most of the inhabitants of Atafu. Both groups of missionaries worked on Fakaofo, resulting in a mix of Catholics and Protestants on this atoll. In 1889, the islands were claimed by Britain. They became part of the Gilbert and Ellice Islands (Kiribati and Tuvalu) in 1916, which was then renamed the Union Group. Though Tokelauans are Polynesian, some have European names, a result of visits by whalers and European explorers in the late 19th century. In 1925, the islands came under the administration of New Zealand. They became a New Zealand territory in 1948. Today, more Tokelauans live outside Tokelau than on the islands. About 6,800 live in New Zealand. As a territory, Tokelau has had an Administrator appointed by the New Zealand Minister for Foreign Affairs; however, in 2004, the Administrator delegated his powers to the three Village Councils. Since 1996, Tokelau has also had a legislative body, called the General Fono council, which deals with national issues. In addition, every three years, a Village Head is elected. Daily activities in the villages are managed by elected mayors. New Zealand statutory laws do not apply to Tokelau except when they are expressly extended to the territory. New Zealand contributes development assistance to Tokelau, which amounts to most of the territory's budget. In 2006, and 2007, Tokelauans held referenda to decide whether to move to self government in free association with New Zealand. In both referenda, the citizens failed to achieve the required two thirds majority. Tokelau is a full or associate member of many international organizations, including South Pacific Regional Environmental Programme, the Forum Fisheries Agency, the World Health Organization, and UN Educational Scientific and Cultural Organisation (UNESCO). Tokelau culture is Polynesian culture. Sharing of resources according to need and respect for elders are integral characteristics of this culture. Age typically determines the level of employment; the older Tokelauans holding managerial positions. Fiafia night (a traditional dance) on Nukunonu Atoll. Image courtesy of Tokelau Liaison Office, Samoa. The division of labor has men involved mostly in fishing, farming, and construction and women in maintaining the villages. However, many Tokelauans are employed in public service, and such divisions of labor are blurred in these occupations. Most of the land is managed by kin groups. Many Tokelauans are members of more than one kin group. Essentially all Tokelauans have rights to land and to a share of the produce of the land. Although land can be transferred to other Tokelauans, it cannot be transferred to foreigners. Each atoll consists of one village. The villages have a small-town, rural character, although, as a result of the small amount of inhabitable land, they are densely populated. 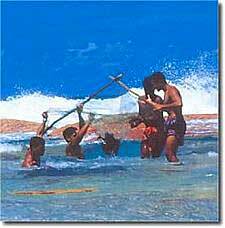 All the villages hold regular inter-island sports, dancing, and fishing competitions. There is one school on each atoll, which provides education for pre-schoolers and kids years 1 through 10. There is one University extension, the University of the South Pacific, on Atafu. The population dresses conservatively and strictly observes the Christian Sabbath. Atafu is the most conservative island. There, alcohol is rationed. Traditional foods include fish, sweet potato, taro root, breadfruit, pork, poultry, and coconuts. A fermented drink, Kaleva, is made from coconut milk. Imported foods are available in the village cooperative stores. Homes historically were made of local timber with thatch rooves; however, in the 1970's, imported wood and concrete were used to construct sturdier homes. Still, many residences are one-room dwellings with carpets consisting of mats made with leaves, sleeping mats, various chairs, tables, and other furnishings. Cook houses are typically separate. 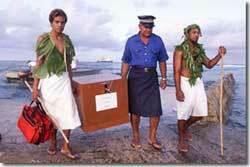 Satellite TV and internet are recent arrivals to Tokelau. Listen to the Te Vaka Band! Tokelauans produce fine woven handicrafts, such as mats, bags, hats, and fans. Tokelau stamps and coins are also sold as collectibles. Traditional Tokelauan music starts with choral elements and adds percussion with log drums, wooden boxes, and biscuit tins. A Tokelauan music group, Te Vaka ('the Canoe') brings Tokelauan music and dance to international destinations. Tokelau celebrates both religious and secular holidays with feasts, athletic competitions, and parades. In addition to celebrating New Zealand public holidays, such as Waitangi Day (the day British sovereignty was established over New Zealand, February 6th), and traditional Christian holidays. Tokelau island councils designate two village holidays each year. There is little tourism on the atolls of Tokelau. Thus there are few tourist attractions... which means that a visit to Tokelau affords a quiet getaway, far off the beaten path. The main recreational activities are swimming and snorkeling in the lagoons and coral reefs. During a special event, such as a holiday or pageant, tourists may be treated to performances such as traditional singing and dancing. There is one hotel in Tokelau, the Luanaliki. This hotel is located on Nukunonu. There is one resort, Fale Fa, also on Nukunonu. There is also a guest house on Atafu, the Feliti Lopa. The best way for tourists and travelers to get to Tokelau is from Apia, Samoa, by ship. The government-run MV Tokelau provides passenger and cargo services to and from Apia every two weeks. The trip takes about 24-36 hours each way, and the ship makes the round trip in five days. Passengers must bring their own mattresses to sleep on. Food is provided, and there is one bathroom for the passengers. Since there is no harbor in Tokelau, launches are used to embark and disembark. The ship's schedule can be found here. There is also a larger ship that makes the trip once a month. The only other ways to get to Tokelau are by private boat or private helicopter. 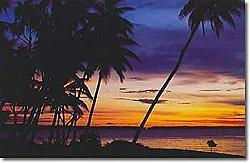 Use Apia, Samoa as your destination and compare the travel services. Do you have a business related to Tokelau or the South Pacific that you would like to advertise on this website? Tokelau.com is currently seeking royalty free images of the New Zealand territory of Tokelau and the people living there- for use on our webpages. © 2008- 2018 Tokelau.com. All rights reserved.